This Proceedings document was developed to provide a summary of the 1% National Convening that took place in Boston on October 18 and 19, 2018. More than 200 individuals gathered to listen to each other, share ideas, and develop state-level action plans. 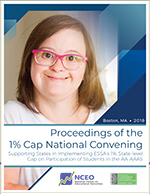 The purpose of the Convening was to support states as they work with local education agencies to implement the Every Student Succeeds Act (ESSA) requirement of a 1% cap on the participation of students with the most significant cognitive disabilities in the alternate assessment aligned with alternate academic achievement standards (AA-AAAS). The Proceedings document includes appendices and links to resources that were shared by states and others at the Convening.